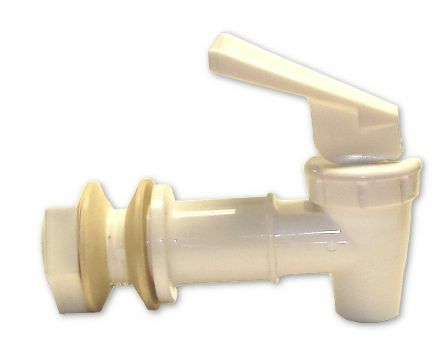 This high-quality, American made, economical, brew-safe replacement spigot for Kombucha Kamp Modern Porcelain Continuous Brewer is available in your choice of three colors. Made from the same high quality plastic used in the beer and wine industries as well as by many commercial Kombucha companies, this spigot now includes a FREE Spigot Brush, which makes cleaning even easier! Also compatible with our Stainless Steel and Toasted Oak Barrel options. Prior to starting a new brew, it’s important to check the spigot for leaks. Attach the brew-safe spigot to the vessel properly and then fill it with enough water so that the spigot is completely covered. Wait at least an hour, up to 24 hours, to check for any leaks in the assembly. If there are leaks, no worries, just empty the vessel, unscrew the spigot, adjust the washers, and reattach. Usually flipping the washers helps fix any issues. Keep testing until no leaks occur. Sometimes yeast or bits of SCOBY may collect inside the spigot and clog up the flow. This is perfectly normal but can be frustrating. Rather than having to take the whole assembly apart every time this happens, simply dislodge them with the FREE spigot brush included with every KKamp spigot. If you did not order a spigot from Kombucha Kamp, you can try using a toothpick or something similar to dislodge the blockage. 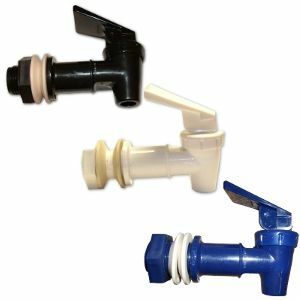 When it is truly time to clean the spigot, or if it proves too difficult to remove a blockage, simply take the spigot apart and run under clean, hot water which should flush the items. When unattached, it may also be easier to pick out any remaining yeast or SCOBY. If the brew molded, however, it is advised to use soap, or in extreme cases even bleach, to remove any residue prior to restarting the Kombucha brew in the same vessel. Why use a spigot when brewing Kombucha? Spigots are certainly not required to make Kombucha at home, but they can make the process less messy and overall more convenient. Usually this is accomplished via the Continous Brew method, which is popular with millions of homebrewers all over the world, as it makes delicious Kombucha more quickly and with less mess than Batch Brewing. Continuous Brewing, aka "CB," works best in a larger vessel with that spigot attached. However some brewers choose to use a vessel with a spigot to make large Batch Brews rather than Continuous Brews by draining the vessel each time rather than leaving them partially full. This takes longer but especially if one only plans to brew every once in awhile, this can be useful. Each brewer finds the style that fits their needs, but no matter what method is used a spigot will always make the process cleaner and easier. These plastic spigots work amazingly well, especially when compared with the standard ones that come with glass dispensers. They are fast and durable. I recently ordered a few more to have on hand. This spigot just keeps on working with no clogs. I have some cheap sun tea jars that I make kombucha in. The spigots on these cheap jars quickly clog with the scoby growing in them. The spigot from KK on my continuous brew vessel just keeps working and working. No problems at all! New spigot for my old crock. Good quality. Time to try continuous brewing! I️ ordered the plastic food grade spigot and it arrived within a few days. It was easy to install and works like a charm. Four weeks into continuous brewing! Love my KT. Recently bought the CB system and quickly realized that I wanted more than the one CB system was giving me. I remembered that I had a glass Mason jar drink dispenser that I stopped using because the spigot didn't seal completely. Researched to make sure the bottle was safe to use and then ordered a spigot. It fit perfectly and now I have some Kombucha vinegar starting in one and my supply of Kombucha tea in the other! 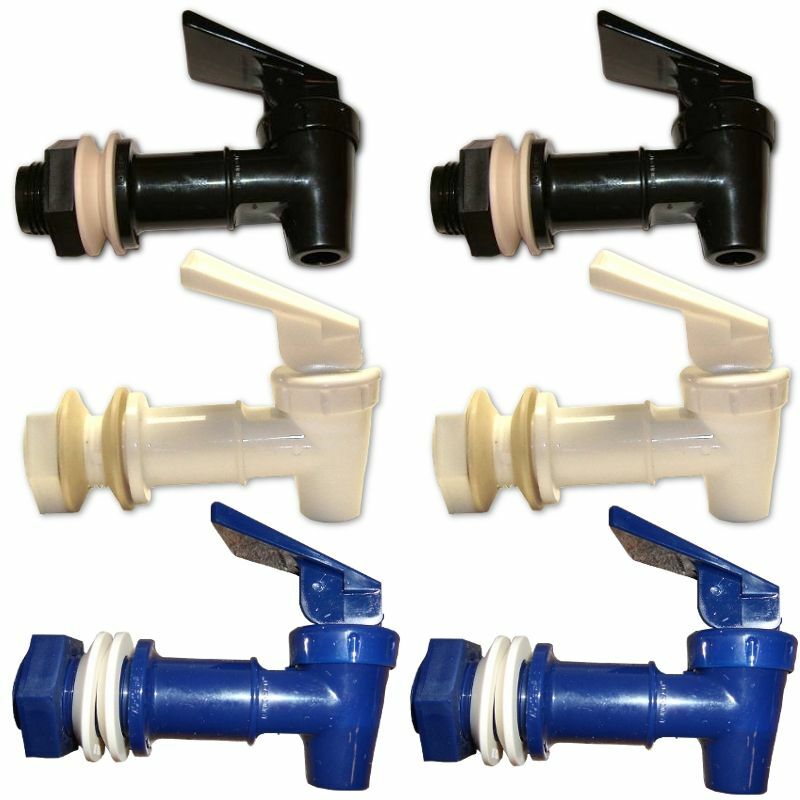 I love these quality plastic spigots. I have replaced several on my jars and have had no problem. They are working perfectly. My old spigot kept getting clogged, and it eventually would not let any kombucha through! I think a SCOBY might have formed inside it, and I was unable to clean it out. This spigot fit perfectly in my vat (I did not need to drill a bigger hole like some reviewers) and after months of use it still lets kombucha flow perfectly. I don't know why it is working better, but maybe it is wider inside. I have yet to use the cleaning brush it came with. Problem solved! These spigots are great! They were sent quickly and are so easy to attach to replace the low quality spigots that usually come with most dispensers. They are also very easy to take apart and clean for seasonal brewer cleaning or if they ever get blocked up by SCOBY or yeasts. I purchased 2 of the plastic spigots. Not only did I get a good deal on buying 2 of them but they fit nicely in 2 of my gallon jars. I feel so much better having quality spigots in my kombucha brewing jars! They also look nice and work very well, so much better than the old spigots I had! I would absolutely recommend these spigots. I already had my own crock, but purchased a plastic spigot to replace the old, yucky one so it would be clean, seal properly and metal free. It fit perfectly and I was very happy to find an affordable and convenient solution all in one place! These spigots are awesome! They do not leak and are well made! The shipping was very fast! Wonderful experience all around! Love Kombucha Kamp!! We had purchased a glass 2-gallon pitcher and the spigot was continually clogging. We purchased this spigot as a replacement. We had to do as others suggested and use a dremel to enlarge the hole. It is 1000 times better than the old spigot! No clogging. Great product for your kombucha brewing needs! I bought 2 spigots about 6 months ago. I love it. I bought a 2 gallon glass beverage dispenser and removed their spigot. I did have to go to a local glass shop and have them enlarge the whole a little as I was afraid it would break if I tried. I leave my continuous brew on my counter. At first, I concerned about a leakage so I left a little pan under the spigot. After 6 months, no leaking from spigot at all. I would recommend this product 100%. I was really excited when I ordered 2 spigots for a continuous brew jar that I had used a few years back. However I did not measure the hole of the container and when I received the spigots was very sad because apparently I needed 1/2 inch instead of 3/4 inch.. I ordered these spigots and they work great in jars I previously had. I did enlarge the holes with a dremel glass cutting bit. The flow is so much better and consistent without the worry of contamination. I purchased these spigots to make my continuous brew system easier. The spigot that came with my brewing vessel was super slow and this made harvesting my booch very tedious. My husband did have to do a bit of sanding to get this spigot to fit the opening, but it was well worth it. Thanks Kombucha Kamp! I barely ordered this, and it is already shipped! You people are on the ball! Thank you. Such a pleasure to shop at Kombucha Kamp. I ordered 2 spigots. I have a great container for my continuous brew but it had metal spigot. When my spigots arrived I was a little concerned about the size. But the spigot works and fit beautifully! I have the 2nd one in reserve just in case. I will never stray too far from Kombucha Kamp!!!!! When I was cleaning my vessel I changed out the spigot that came with the glass vessel to the KK spigot. It was easy to switch out and fit perfectly (even though it was a vessel I bought at Target!) Love all products purchased from this site so far, and their customer service is spectacular! I was looking around for the right container to do a continuous brew, and realized I had a 2 gallon water crock with a spigot. But it was a metal spigot. Found these plastic ones here, and ordered two (an extra for just-in-case). It fits perfectly and now I have the perfect brewing crock! It works great and doesn't leak. LOVE these spigots. Had to enlarge the hole in my glass jars, but read in previous reviews it's easy with a dremel, and it was. Flows freely, no more clogs! I had an old porcelain water jug that I wanted to use for CB and was happy to see that all I had to do was replace the spigot and I was good to go. The spigot fit perfectly into my jug and I was also content to know I was using a Kombucha-safe spigot. On a side note, the shipment was super fast and was also please when my receipt had come printed on the back side of a piece of paper that had been previously used and made me feel good to be giving business to a company that obviously cares enough to try and make environmentally good choices as well! Thanks KK, I will be back! I have purchased multiple spigots from KK. They are great quality. Love the hands-free pouring! They arrived in the mail quickly as well. After my friend told me about this spigot that fit a glass jar we both had I ordered my own plus another one for the next friend to start continuous brewing. Exactly what I needed at a great price. 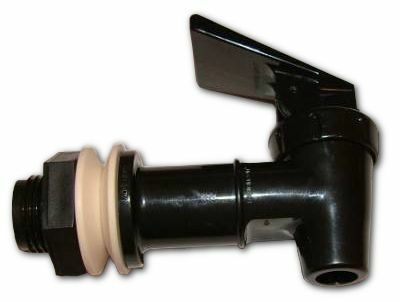 I'm extremely satisfied with the spigot that you can't get in sticks where I am & can't wait to use it next cleaning. These spigots are GREAT! They fit perfectly and are so easy to install. Makes continuous kombucha so much easier. My order arrived quickly. 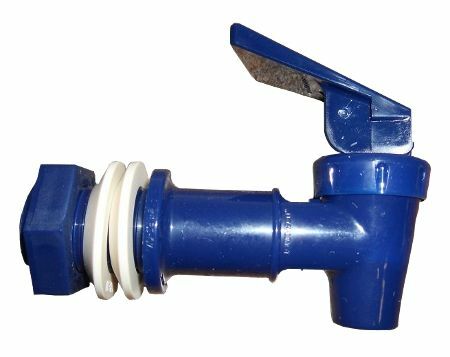 The spigot is good quality. The size is bigger than those on cheap store bought vessels. We bought two of these spigots and they work great! They didn't fit our vessels, so my husband just reamed out the spigot hole with a diamond cutter to accommodate the new spigot. Works GREAT! I was so grateful to see this spigot offered as my old one was getting to be done with. I purchased more than one because I intend to get a continuous brew going when I get the time to set it up in my soon-to-be dining room/kombucha cellar! I purchased the spigot to replace the unsafe one on my glass dispenser. It fit perfectly, and was so easy to install. I like knowing I'm using a safe spigot. Couldn't be happier, once again, with my KK purchase. I decided to try continuous brewing with a large glass sun tea jar I had. I had read that it is not safe to use a cheep plastic spigot with silver coating and unfortunately that is what I had. I was so happy to see that Kombucha Kamp has spigots that are safe to use with Kombucha and at a very reasonable price and that I didn't have to go shopping around. The spigot makes it so easy to fill my bottles. Thanks to the reviews on here, I learned that the silver painted plastic spigot that came with my glass CB might chip. It only took two days and I was seeing what looked like silver flecks in my cup. I purchased this spigot and my scoby and brew are happy again. It fit perfectly and was easy to apply with no leaks. We were very happy that KKamp made us aware of the need to change out our spigot on our store bought glass jug for CB. We did need to slightly enlarge the jug opening to make it fit, which was easily achieved with a dremel tool and the appropriate bit. Never leaks and we love the control of the pour with this spigot. I bought the spigot to replace a silver painted one that came as part of a glass beverage dispenser because I was worry about finding silver paint residues in my kombucha. The silver paint oxidized and chipped within 2 to 3 weeks of continuous brewing. I have been continuously brewing ever since and I am very happy with the product and the support. I purchased the new spigot, ph strips, and the thermometer for the side of the brewing vessel. Both came promptly and were easy to use. I'm hoping having the right equipment will improve the taste of my kombucha. Articles on facebook have also been very helpful.